Shale deposits, unconventional rock formations containing natural gas, typically require horizontal wellbore drilling to extract the gas. Lateral lengths of shale gas can be up to 10,000 feet within the shale, traversing in x, y, and z directions, at depths as low as 20,000 feet below the earth's surface. Horizontal drilling utilizes hydraulic fracturing to connect large areas of the reservoir to the well to increase extraction rates from targeted formations. Field portable XRD and XRF analyzers are ideal tools for finding targeted formations with speed and accuracy. They help maximize the efficiency of expensive drilling operations by quickly finding commercially viable target zones for fracturing the rock while minimizing environmental disruptions. The TERRA® portable XRD analyzer quickly identifies and quantifies the mineralogy of drill cuttings to help find the right location. The analyzer directly measures dolomite, chlorite, illite, calcite, pyrite, quartz, albite, clay, feldspar, silicates, aluminosilicates, carbonates, sulfides, apatite, and more. The TERRA analyzer can be used to test along lateral lengths of shale deposits, quickly providing mineralogy to help determine fracture potential and reservoir quality. With the TERRA portable XRD, cuttings can be analyzed quickly and at closer intervals to help stay on track. XRF analyzers quickly and accurately identify elements of interest for zone boundaries, fracturability, and productivity. 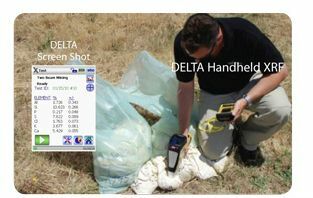 The chemical composition of surface and bagged soils, cores, and cuttings can be measured rapidly with the DELTA® handheld XRF analyzer to determine zone boundaries and fracture potential. Field samples can be collected, split, and bagged to analyze for productivity using the TERRA XRD analyzer for mineralogy and the DELTA XRF analyzer for trace elements, as well as to reveal poorly crystalline or amorphous phases such as phosphates. 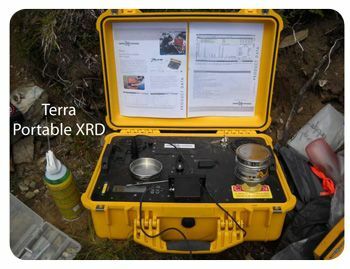 Field portable XRD and XRF aid in staying with the lateral shale gas wells as they traverse within the earth. They help keep drilling productive and on course, saving time and money as well as minimizing environmental disturbances by reducing unnecessary well drills for sustainable resourcing. 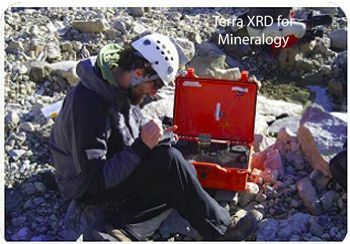 The TERRA analyzer makes it possible to rapidly perform mineral identification and quantification in the field, thus allowing for rapid feedback. The concept of "chasing the vein" of a given mineral strata becomes much easier with a full understanding of the mineral identification as represented in the drill cuttings. The TERRA analyzer requires loose powders of <100 mm which is easily achieved using a simple crusher and sample sieve. Combined with simple sample preparation, the TERRA analyzer provides both ease of use and fast analysis. Directly measure clays, quartz, feldspar, dolomite and more with the field portable TERRA XRD analyzer. The DELTA handheld XRF field analyzers make it possible to stay with the vein by identifying and quantifying elements that determine fracturability, productivity, and target zone boundaries. Directly measure the primary elements of interest for fracturability and productivity including Si, Mg, Ca, Al, K, Fe, and trace metals V, Cr, U, Th, Mo, and Re. Directly measure the primary elements of interest for target zone boundaries including U, Mo, Cr, V, Ni, Mn, and Re. Analyze elemental ratios, including Si/Al, Ca/K, Fe/S, Si/Ca, and Ca/Mg, for indirect measurements of silicates, aluminosilicates, carbonates, sulfides, clays, quartz, feldspar, dolomite, and more. With minimal or no sample preparation, these field portable XRF analyzers measure surface soil, bagged soil, cores, and cuttings directly at the site.